The first impression:< The cover page with blue and white shades with a promising article about medical field is interestingly attractive. The content summary: As it is worth your time and money you can spend for it, you may go for it, for sure. Editorial is like the face of the magazine and we got to know about the key articles and editor’s thoughts about them. This month’s editorial by Mohan Sivanand is quite good too. The interesting section in which is, about the practical experiences his team had when collecting the information for the central article of this issues. How “50 secrets Surgeon Won’t tell you” – title failed them collecting anything stuff from the surgeons, and when the same thing is rephrased to something else (well, you need to read the issue, to know what is is changed to), worked fantastically! – is really eye opener. It shows the important of the representation of the task/talk? The indirect short and sweet message is, represent the thing in a way someone like to respond to. It is quite applicable in almost all aspects of the life. In addition the editor discusses some other important articles as well. 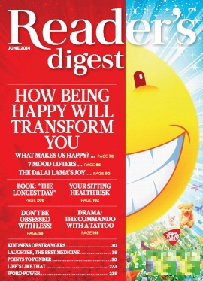 In reader’s reactions section you got to read the opinions and views about various articles published in May 2014 issue. The most evident are the responses for the magazine Science Today. It is interesting read to explore people’s love and affection, and mainly the respect for the magazine. The – everyday heroes – section brings an article about Balaji Nanabala, Sarojamma and others. No doubt they are the real heroes of the society, who work for the betterment of the society. The article could have been started in a rather more interesting manner for better impact. Leena Sharma discusses her two traveling experiences. Both with different politicians in the same compartment. How she and her friend was humiliated in the first experience is shocking but factual (as it is her own experience)! And how her second experience (with a different friend, as the companion of the first tour were not dare to face it again! ), when she was en-route to Gujarat, is quite opposite of the first one. It shows that as there are no two fingers in the same hand are identical, nor two politicians. You will find good and genuine fellows in politics as well. And you can predict the name of the politicians (at least one of them) by seeing the illustration, the names are revealed at the end. It is interesting article to go for. The article about – Insomnia – is focused on the sleep hygiene. The doctor suggest to change the habits rather than being dependent of sleeping pills and tranquilizers. Which is definitely very good. Though you can have the deja-vu feelings while reading about the ideal habits one should have, as it is discussed at many places including magazine articles, books, talk shows, etc. many times. Anyway, thumb rules are thumb rules and they will remain same, but effects of the same is different from case to case (medical terminology you know :)). Of course, you can go through the article to remind the basic and good habits to yourself. You be the judge – brings a curious case from USA. It is about accident between a pickup truck and a motorbike. The driver of the pickup truck was guilty and he accepted it, and fined by the court. The interesting part is the approach by the lawyer that “there was one other person was electronically present and should also be considered as guilty”! You can read the article in the magazine to know more about this case (now it is legal terminology). It surely brings to our attention that the technological advancements come with various intangible effects on the society. Interesting read. The – art of living – article brings 10 simple yet powerful rules to follow in life, to get the maximum of it, and being recognized as a better human being, by the society also. You should read it. 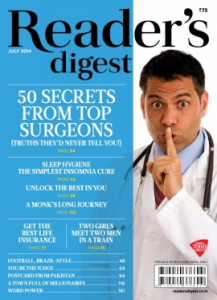 50 Secrets and tips from the surgeons – is the cover page article. It apart from giving some tips to find the best (or rather – appropriate) doctor; gives insight of some of the point of views of the surgeons also. It is a – well researched for – article which is worth a read. Postcard from Pakistan – is rather emotional article which talk about the love and affection which remain alive through generations even after physical distances. Outrageous – is a small yet worth read article. The article about Satish Kumar is focused on spirituality and will found interesting by only a segment of readers. The answer to some questions (especially about the God and his definition) are interesting though. Crushed by Corn – is a thrilling – real life drama. If you want to know that the truth is often stranger than the imagination, you should read it. A lot of people find the article about Sodeto (a village in Spain) and the dramatic overnight change in the lives of people there, very interesting. You gotta read it, at least once. Death and the maiden – is a story of a survival of a girl from rabies! It explores how your will power helps you overcome a lot of major and primarily being seen as – unconquerable – obstacles. An inspirational article. Benji Welson’s article about Judi Dench – is really interesting. She is better known for playing “M” in the James Bond movies since many years. But, she is a lot more than that. An article worth reading. The Lion Whisperer – is a thrilling article which will be liked mainly by the wildlife/animal lovers. Other may want to read it to get some thrilling information. Overall an issue which is mainly focused on medical profession and better life stuff. It is definitely worth reading. Though we miss “book reviews” here.